Scott Presslak designed a new Metra map that aims to be more usable by casual and new riders. If you’ve moved to Chicago at any time since the mid 1980s, you might have wondered why Metra’s commuter rail lines don’t have a pattern to their names. They aren’t colors, letters, or numbers, like the majority of rail transit lines in the world. Some of the 11 lines have similar names: There are three called “UP-something”, two called “MD-something”, two “something-North” lines, and two “something-West” lines. Finally, there are three routes that use Metra’s only electric trains and are all called “Electric District”. It’s that kind of nonsense that Scott Presslak, a former Metra planner, has attempted to correct in his proposed Metra network map redesign (view it full size as a PDF). On the “Diverging Approach” blog, he writes that Metra considers itself a railroad more than a transit agency, and its train lines’ service patterns and names reflect that. The blog is published as part of The Yard Social Club, a pro-suburban transit advocacy website. Most of the line names, the blog post says, are named after the railroads that used to operate the lines before Metra was formed and assumed operation in 1984. Three of them don’t fit this pattern – Heritage Corridor, SouthWest Service, and North Central Service. One of the railroads, Milwaukee Road, after which MD-North and MD-West are named, went out of business 32 years ago. The legacy/host railroad naming scheme made more sense when the RTA first formed Metra back in the early 1980s, but thirty-odd years later it leaves us with a system that’s just that much more difficult to understand unless you’re a daily commuter. Presslak’s map adopts a letter-naming scheme, which is used on the New York City subway, San Francisco light rail, and the Berlin S-Bahn regional express rail, among many other places. Since not all lines serve all stations, Presslak’s map separates some stopping patterns into different lines. It’s common on transit networks around the world to have multiple lines going to the same place, so the change from looking up and distinguishing UP-N trains that stop in Rogers Park from ones that don’t, to “take Line A” or “take Line B” is pretty simple. Mapping apps on your phone are already set up to do this when you visit cities, like Tokyo and New York City, that have multiple lines and routes to get to the same place. Now, choosing Line A versus Line B to get from Ogilvie Transportation Center to Rogers Park isn’t an issue because there’s only one train per hour during the weekdays. Presslak applied the same treatment to the Union Pacific Northwest lines that go to Harvard, McHenry, and Crystal Lake stations. The lettering scheme would be even more convenient on the Metra Electric District line because it has three branches and some of the branches have express service, making for more than a handful of service patterns. Presslak proposes lines U, V, W, X, Y, and Z for the rebranded “Lake Shore Corridor Service”. The map distinguishes other stopping patterns among lines by using shapes, but I think this complicates the system even more by having the map expand beyond a map and show schedules and timing. 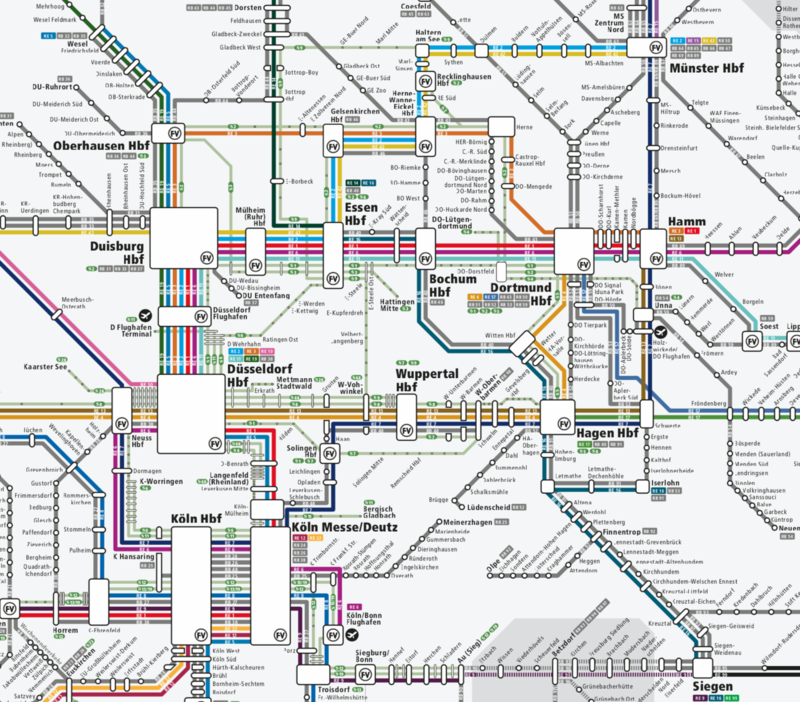 One of my favorite transit maps is the one showing the network of interconnected networks in the state of North Rhine Westphalia, Germany. There are multiple routes that will whisk you from Cologne to Essen, and each line on those routes has varying schedules and stopping patterns. You can take a long-distance train that runs at higher speed, a long-distance train that runs at medium speed, regional trains that run similar to Metra, or even S-bahn trains that are lower capacity than the regional trains but run at higher frequencies and make more stops. Each line may have hourly service, but aggregate all of the lines and each route between cities has service for residents that’s more frequently than once an hour. The North Rhine Westphalia map has no indication about stopping patterns, hours of service, or any time-related information. It’s purely a map of all the lines operated by different companies and how they connect. If you want a schedule, it’s on a separate document. Maps and schedules hardly seem to matter in the electronic age, but for those without a charged up smartphone, or need to understand all options when apps are designed to mostly give “here and now” choices, train companies in Germany separate the lines and times by showing schedules separately on large posters at every station. The area inside this clip has a population the size of Chicagoland. The full map, showing the state of North Rhine Westphalia, includes 18 million people. The colors are there to distinguish the lines on the page, but within each line is the name of the line, like “RB46” for Regio-Bahn 46, which makes more stops than a RE, Regio-Express, line. I like the historical aspect of the names and I think they should stay. Silly Chicagoan, our heritage matters not. We MUST assimilate and do things like everyone else..
Then when we lose our sense of heritage, we’ll be criticized for lacking in it. The map has the historical names as well, in the legend at the bottom. It’s not that heritage doesn’t matter, it’s just that the heritage concerning a handful of railroad companies probably matters considerably less than having a transit system that its riders can easily understand and comprehend. This needs to be done yesterday. I support the historical names. I’d also support Metra as a system that does not reinforce segregation. For example, even though there are wooden covered platforms at 63rd and the Green Line, the Southwest Service doesn’t stop there. Wonder why? The one thing that makes me most want to move out of Chicago is the mental redline of the city that most people have here. I love the new map, but I like that the current names are more meaningful and interesting than just letters. There’s a big difference between heritage and wayfinding. Calling something the “Milwaukee District North” is not some amazing heritage. It is not descriptive, and I’m guessing more than 95% of its passengers do not care about The Milwaukee Road, much less know where it goes. Undoubtedly many of the stops will keep their names and heritage, though they are equally lost to time. I’m sure someone will tell me the deep significance of Greyland or Healy, and sure, that’s heritage. But to the hordes of Cub fans who descend, the heritage isn’t useful. A key feature not covered by Steven is that redoing the map makes it look like there is more service. That is a big improvement. Even if the service level hasn’t changed, the psychological impact is useful. Can you explain how something being named “line C” causes a user to have more information that they can comprehend than the current system? The current system may not be perfect and it may be necessary for a passenger unfamiliar with the system to (gasp!) look for other information besides the name of the line to know how to get where they want to go. For example, Metra’s website separates the lines by direction. But at least the names, at times, give a general idea of which direction they are going. That’s more than a lettering system. And it’s certainly less confusing than a lettering system that separates lines by such things as whether they terminate at a line’s 35th stop or 38th stop (or how many it is exactly, I didn’t count), which was suggested here. really don’t see what the issue is. Nobody expects the name of a line to tell them everything they need to know to find where they are going. It’s just a starting point so they know where to look to find more information. Someone unfamiliar with the expressway system wouldn’t know much simply by knowing the names “Kennedy”, “Edens”, and “Eisenhower”. Should that be changed too? Why? So that when someone suggests more taxpayer funds for improving the extent of service someone could just look at the map and claim there already are so many lines so there shouldn’t be a need for even more? I don’t know why artificially implying there is more service than there is is something that is good. The phrase “Milwaukee District North” may not be descriptive . But neither is something like “line D”. These types of names typically are not supposed to be descriptive. Nobody thinks the CTA’s color coded lines or the expressway’s names are descriptive. The names are just used for identification. If someone needs more information they simply use the name as a starting point and then use any number of means to find out how they get where they want to go. If people think lack of description in the names is a problem the solution of using letters is not going to do anything to improve that supposed problem. Showing more lines helps understand the value people are getting for their money. It’s not artificial; it’s just a different way of viewing the service. 90/94 is joined in the city for awhile. It helps show that while for a little bit its the same road, eventually they go different places. That’s useful, I think. One can make a strong argument that it makes sense to refer to the Metra Electric as three lines instead of one (in fact, that’s really how I think about it). The two branches are fairly small but they are extensive enough that they could reasonably be called a separate line, But that’s the only example on the Metra system were that could possibly make sense. In no other circumstance is there enough variation to pretend that one line is actually more than one line. For example, are we going to refer to Union Pacific Northwest lines that use the McHenry branch, where that is the only stop on the branch, as a separate line as those that go to Harvard? There are, I think, two or three trains in each direction that use the McHenry branch. Are those trains an entirely different line even though at least 90% of the stops are the same as those that other UP-NW trains use. And in fact, I think the proposal based on the way it is described (I haven’t looked at the map) would even describe trains that don’t go all the way to Harvard, and instead terminate at the second to last stop as a lot of the runs do, as an entirely separate line. That’s just nuts. In my opinion, if there was a serious proposal like is being discussed it would be immediately laughed out of consideration when it takes one step into the court of public opinion. First off: Yes, we should absolutely change the Chicago interstate naming system! The fact that Chicago assigns names like “Kennedy” and “Edens” to highways that already have pre-existing numerical names, and does so largely without signage, is stupid and I can’t think of any other city that does it on this level. It makes it needlessly harder for visitors and travelers to navigate the city, particularly when it comes to traffic reports. Second, assigning a letter-based system to Metra shouldn’t be about giving people more information about where they’re going, it’s about creating a system that is easy to organize in the human brain. The way the lines are named now it’s not even obvious that they belong to the same transit system, and you have to commit obscure names to memory instead of just noting where lines go. Giving them all a uniform lettered naming system provides a schema for passengers to use in planning their trips and in turn makes it easier to process all of the other information – stops, schedules, etc. – that comes with using the service. How is a meaningless color easier to “mentally identify” than the geographic name of the destination served? You still need the destination (Howard or 95th) to know which train to board, so the colors add information that’s never actually used by the rider, except when consulting a system map. A color or letter based system is easier because it is exactly that – a system. 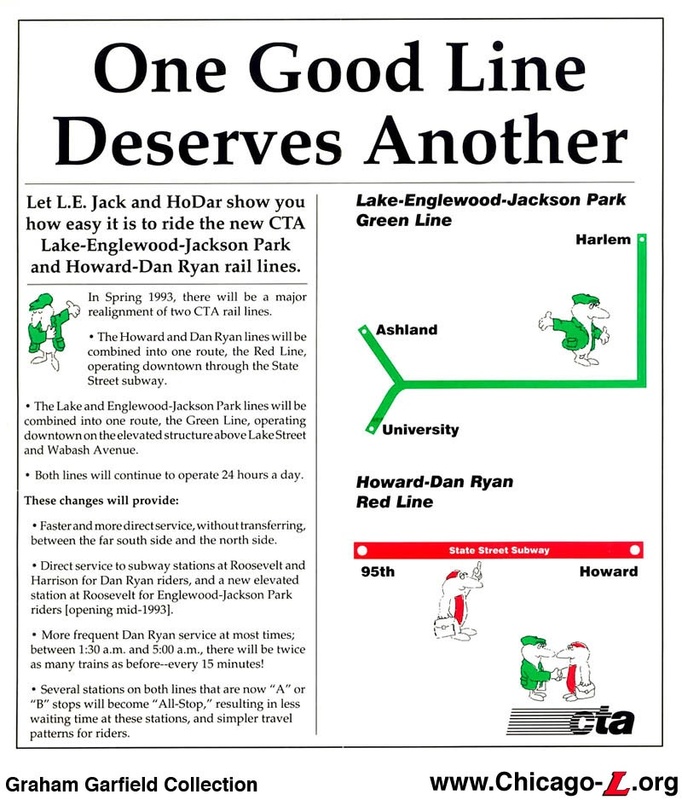 The old CTA system required you to memorize individual unrelated names – Ravenswood, O’Hare-Congress-Douglass, Lake-Englewood-Jackson Park. If you only use one of these lines, fine, no big deal. But if you’re trying to use them as a system, memorizing every name becomes difficult and interpreting a map or schedule can become overwhelming for some people. There isn’t a pattern to the naming system, and our brains are trained to remember and interpret interrelated things in patterns. If there is no pattern, it’s harder to remember and initially discern. The color/letter system takes a preexisting pattern that any passenger can easily use and grafts it onto the train lines, allowing people to adapt the train system to a pattern that already exists in their heads instead of needing to add a whole new system to their brain’s internal computing. There are many ways to name transit routes–colors, numbers, letters, number/letter combinations, names of areas served, major streets or attractions/venues. Every system ends up with inconsistencies because the actual routes don’t follow the theoretical naming systems. In my experience, route designations are a minor issue compared to frequency, reliability, fares, and hours of service. When the OTP crests 95% worrying about naming schemes might be entertaining. how is the destination or route of the line “disconnected”? I think it’s debatable to call Metra a system. It’s more a collection of lines. I would guess that the number of people transferring from one Metra train to another is slim to zero as they have no transfer points outside of their downtown terminals…and that’s IF they even arrive at the same terminal. There are multiple transfer points. The Congress (Eisenhower for younger folk) was built long before the Interstates. When opened, the Kennedy was called the Northwest Expressway. Then we had martyr naming, and in order to placate the GOP, changing Congress to Eisenhower. Mayor La Guardia tried to get New Yorkers to call Sixth Ave ‘Avenue of the Americas’. Most New Yorkers ignored the name change. OTOH, many US cities have a Martin Luther King street/drive/blvd. I should note in passing that the Boston Red Line subway uses “inbound” and “outbound” rather than either NB, SB, or Uptown, Downtown, which flips at South Station as the line passses through the CBD. Blue is not as descriptive as West-Northwest” the former name for the Dearborn St Subway line. Speak for your own brain. I never found it all that hard to associate a set of words with a line on a map. That was a station, that was abandoned in the late 20th century(pre-Metra days) by(want to say) Chicago and Eastern Illinois Railroad. Yes, you are right that Metra should better serve neighborhoods like that. In one of the next few years, Metra was planning to build a 79th Street station on the Rock Island line. So maybe slowly but surely someday, that goal to fix the past problems of redlining will occur. When was the last time anybody actually looked at a Metra timetable? To Metra’s credit, their was a major marketing effort (and quite successful!) in the 1990s to correctly identify each route by the color legend of its original operating railroad, as competently displayed in their timetables still being printed. Frankly, this proposal for a “new and improved” identification of Metra routes cannot be discerned as having a real purpose. Instead, like Hollywood and music just rehashing former hits (not too successfully), instead of developing something really new, innovative. In this case, Metra correctly evidences a respect for the history-and tradition-of our railroads. Indeed, a Metra locomotive was recently painted in the color scheme of the former Rock Island Railroad, and runs on that line, in respect to Metra’s retiring CEO, Don Orseno, a former engineer on “the Rock,” who prevailed to turnaround Metra in the past five years. Do note how the Connecticut DOT has gone as far as painting its engines in the color scheme of the former New Haven Railroad. In essence, people who understand history appreciate and respect efforts to keep it in the forefront of our thoughts. Their is absolutely nothing wrong with the current concept of indicating different commuter lines by the name AND timetable color scheme of their former railroad operator. Then if you’re that talented it shouldn’t make much difference to you whether the Metra lines are named after letters or old railways. Might as well switch it to a system that makes it just as easy for others. Why stop at railways? The major arterial streets should also have an easy-to-use lettering system. And don’t even get me started on the regional waterways.